Aidan Guerra has been moved to the middle for the clash with Penrith. AIDAN Guerra is well aware of the litany of danger men in the Panthers side, but one in particular he understands better than others. Guerra and Penrith halfback James Maloney spent three years together at the Roosters, which included the club's 2013 premiership. He knows how persistent Maloney can be and the Knights must shut him down with resolute defence, not by trying to get in his head. "There's no use. He doesn't listen to anyone. Never has," Guerra said. "He's not really one of those guys you can rattle. He just gets on with his job and that's what's made him such a great player for his career. "He's a guy who can create something from nothing. He has a composure about him where if it doesn't work the first time he's still going to go for it a second time. "As a side we have to be ready to defend for 80 minutes to try to put ourselves in the best position possible for our offensive weapons to finish the game off." Guerra starts with the 13 on his back on Friday night as Mitch Barnett shifts into the second row. It's through the middle of the park the Knights' defence needs to improve, after two quick tries in the first five minutes against South Sydney came through that passage of the field and put them on the back foot. Guerra targeted James Maloney as Penrith’s main danger man. That is where one of the Panthers' other dangers will be coming at them, with Trent Merrin expected to play despite a fractured finger. "He's one of those players who can change the game with his footwork around the ruck," Guerra said. "His ability to bring people onto the ball outside him and break tackles is something that's earned him State of Origin and national representative duties. "Even though they [Penrith] might be down on one or two numbers we know what to expect from this pack. "They're going to run hard and they're going to lay the platform for Jimmy Maloney to try to create some things for them." Newcastle go into this match with their fifth different halves pairing of the season, as Brock Lamb comes back to apply more pressure with his kicking game. Five-eighth Connor Watson said Lamb elevation to halfback will free himself and Kalyn Ponga to play their natural running game. 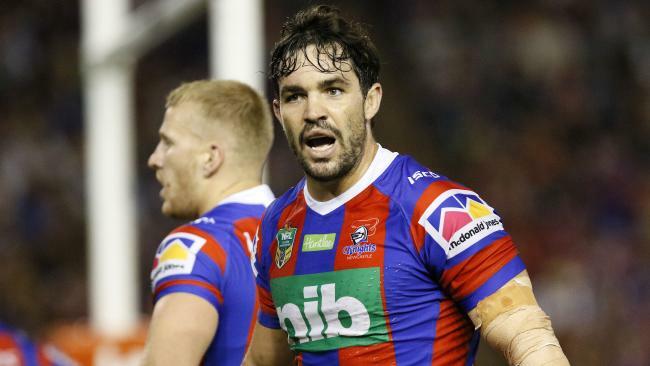 Watson ran for 132 metres in the loss to the Rabbitohs, the second most in the Knights team. "Brock's more of a controlling halfback, which allows me and Kalyn to roam the field and play free," Watson said. "We all know running is one of my main focuses and it's good if I can just do that and hopefully get the team on the front foot. "When I'm running I play my best footy so I think that's a big thing for me, and just get Kalyn into one of those spaces and we'll be right."